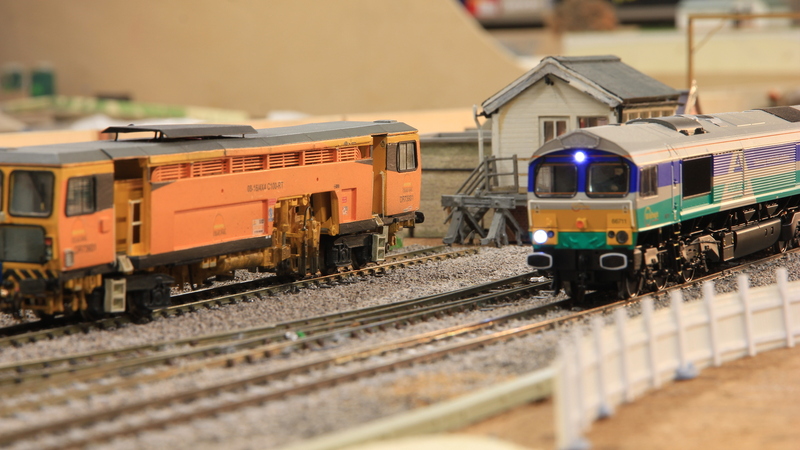 Back in 1983 we started to plan and build a new layout to succeed the buccolic ‘Chiltern Green and Luton Hoo’ – we set our sights a little to the north of Keen House and based the new project on the approaches to King’s Cross, with all the complications inherent to engineering the real railway into a capital city. The site has more complexity in the design of the railway than could ever be conceived by someone inventing a model railway plan. It was to be a railway, in an ‘area of outstanding unnatural beauty’ fully embedded within its scenic context, but the only green field would be a small park on top of the curiously named Copenhagen Tunnel. There were many reasons for choosing to model such an urban scene: one of the most pressing was that accurate models of cities are very rare, so we thought the challenge would be worth taking. What we had not quite appreciated was how much work even the beginning part of the project was going to involve! The project started with the ‘simple end’: the Holloway Bank. This enabled us to try out many new building techniques on a relatively small layout. Over the years the project has grown to its full extent and we have now begun building the entrance to King’s Cross Goods Yard with the York Way viaduct in the background. The lighting fascia is now at full length: the 7 metre span of this is itself quite an engineering achievement. The scenery has now passed the North London Railway Viaduct as well as the highly detailed goods yard on top of Copenhagen Tunnel. 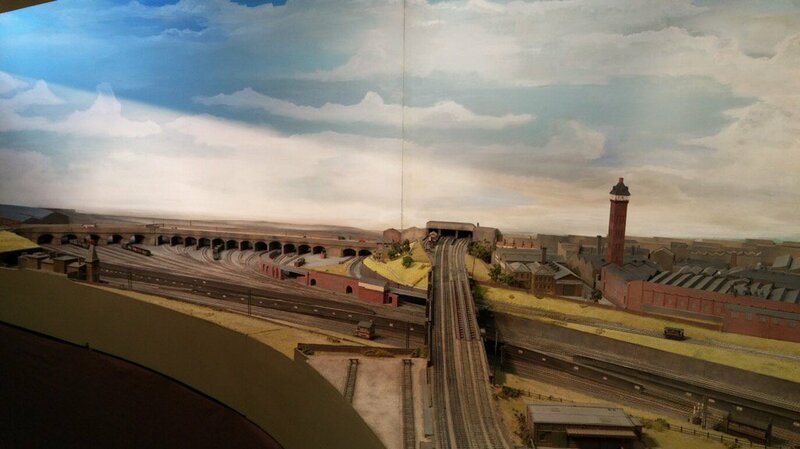 This part of the model includes the area immortalised by the 1955 Ealing comedy film, ‘The Ladykillers’. 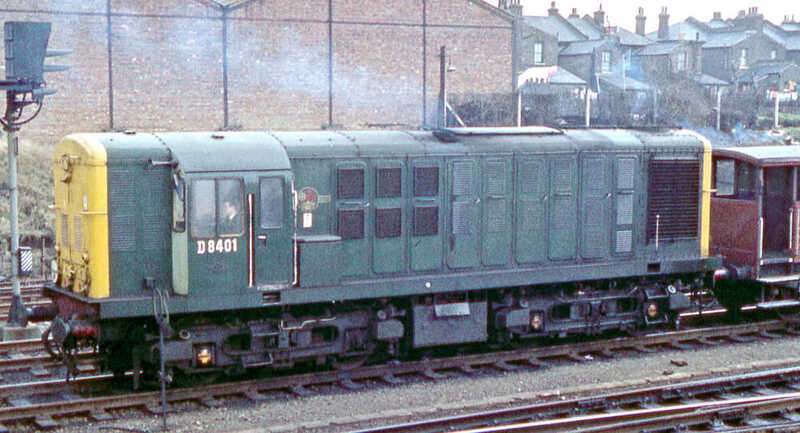 The layout has appeared on numerous TV programmes, including Blue Peter four times. The layout is named after the park that sits on the top of Copenhagen Tunnel, the second tunnel, about a mile North of Kings Cross. The name Copenhagen Fields is from the Ambassador of Denmark’s residence in the 18th Century. This was a public meeting area and noted for rioting in the early 19th Century. Nowadays the area is famous for being the entrance to the new Channel Tunnel Rail link that emerges from its tunnel to terminate at St Pancras. In the background of the model can be seen the Metropolitan Cattle Market, the tower of which still stands. On viewing our diorama, the layout appears larger than it really is because the scale reduces to 1:250 towards the back of the model. The model is accurate for length, except that Copenhagen Tunnel is shortened by 50%. Construction of this swathe of London has obviously been very time consuming for the Club members involved. Indeed some of the buildings have been constructed by members in Germany, Thailand and San Francisco. By the nature of the project, there are already many more buildings than exist on most layouts. Time saving devices are used, such as specially made resin moulded houses, photocopied windows and wooden mouldings for the massed roofs on the distant buildings. On top of all this, Copenhagen Fields can absorb an infinite number of figures, road vehicles and livestock (on its way to market). 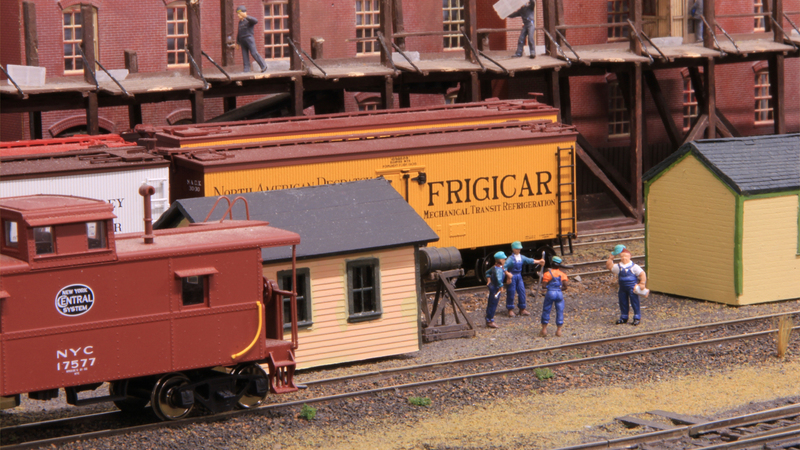 The layout is set in the between-the-wars period, but trains cover the period back to the 1900’s, with most of the locomotives scratchbuilt to 2 mm Finescale standards. 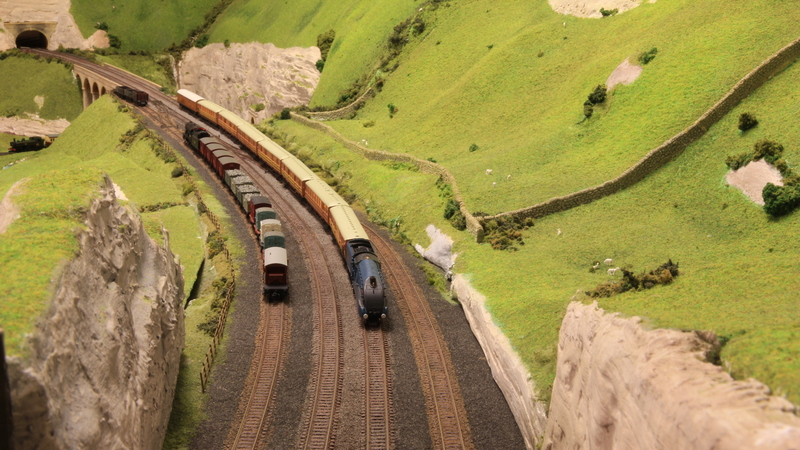 Some of these models have covered over 100 real miles of running: the layout is about a scale mile long. Essential major components such as track and wheels are available from the 2 mm Scale Association, which exists to promote interest in this scale (See www.2mm.org.uk for more information). Our entire track is therefore hand-built using Association components. This either consists of soldered construction, utilising copper clad paxolin sleepers with etched brass chairs supporting the rail, or plastic mouldings. There is no sleepered track used in the hidden sections. Instead, 8 x 2 mm brass strip is laid directly, to gauge, on the plywood base of the hidden yard boards. It is held down with small countersunk screws and is Araldited to the wood near the baseboard joints. Track made in this way is immensely strong at the joints and offers other advantages. It is possible to place stock on the rails very quickly and if something derails it will travel on the wide rail head without falling off. The use of this system is straightforward for straight track, but persuading the strip around a curve is not. To assist this, a special precision rolling mill was made to hold the strip flat as it is bent. The layout has to be carefully crated for transport and storage. Despite its size, the whole ensemble fits into a 35cwt Luton headed transit van. We have now attended exhibitions with the layout for over 25 years and it has always been shown as a ‘work in progress’. One of our claims is that the model never attends two shows without something new added to it. The original plan was very ambitious, but clearly sound, and as the project continues into its fourth decade we look forward to further developments. The layout is named after the park that sits on the top of Copenhagen Tunnel, the second tunnel, about a mile North of Kings Cross. The name Copenhagen Fields is from the Ambassador of Denmark's residence in the 18th Century. This was a public meeting area and noted for rioting in the early 19th Century. Which way is Kings Cross? Left hand end, as you look at the model. What are the two tall towers on the layout? The white tower (still extant) was a clock tower and offices for the Metropolitan (Caledonian) Cattle Market in 1852. This market avoided live cattle being taken to Smithfield Market. The other red brick tower is the EboniteTower - demolished 1983 - and was a chimney and water tank for testing hydraulic meters. Where was the Ealing comedy 'The Ladykillers' filmed? Mrs Wilberforce's famous house was close by the southern portals of Copenhagen Tunnel: we do not have room for it. The out-takes from the film can be seen on the layout's video display. 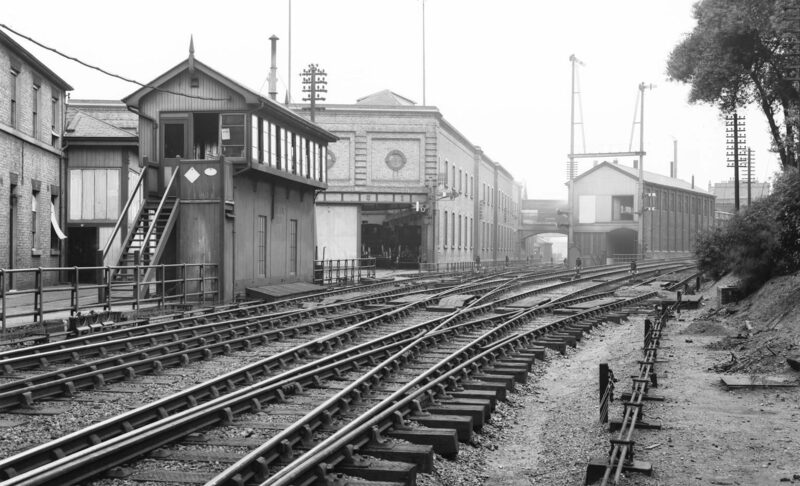 The characters from the film are in the forecourt of the North London Railway (NLR) station whilst the private owner wagons in the goods yard carry the actor's names. Where does the Channel Tunnel Rail Link come out? Just to the left of the NLR, parallel with the large viaduct. Why is there an airship? R33 flew around London a number of times after the Great War to advertise Government War Bonds. Our model is to an extremely small scale: at full size the airship would be 1/4 the length of the layout!